Brilliantly written and directed by Dan Gilroy who’s the brother of renowned director-writer Tony Gilroy (The Bourne films, Michael Clayton), this well-paced film is a unique and thoroughly entertaining thriller about the dark adventures of a sociopath in the nocturnal side of video journalism in Los Angeles. It may, metaphorically, be about the extremes that an entrepreneur must take in order to rise to the top quickly and succeed flawlessly in business, and in that sense, this may be one of the best and most realistic entrepreneurial-related movies in recent years. 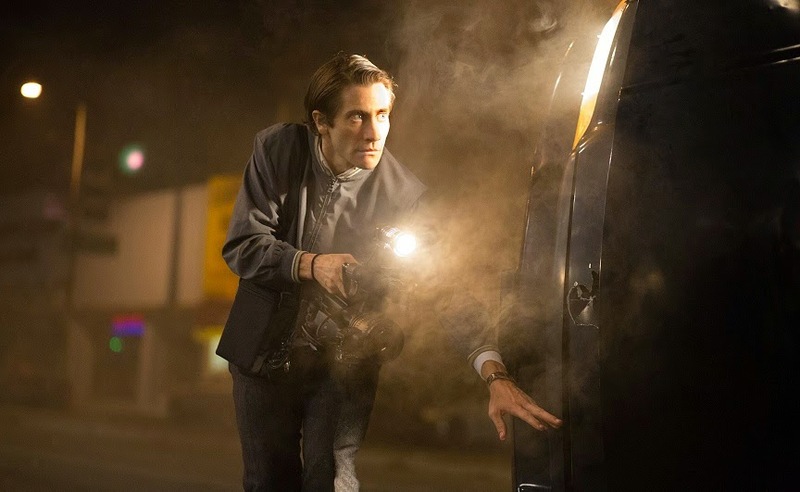 Nightcrawler is now certified fresh on Rotten Tomatoes with over 90% positive reviews and many critics is tipping that Jake Gyllenhaal’s performance here may earn him nominations in the coming award season. I can’t disagree. Played by Gyllenhaal, Louis Bloom is a jobless but smart and self-motivated man who’s so desperate to make a living, he’d break the law to unknown extend. He starts off by stealing and selling stolen materials while going around trying to get himself hired for almost anything but to no avail. One night, he stumbles upon Joe Loder (Bill Paxton) and his crew who’re recording a live footage at a car accident to sell to news stations. 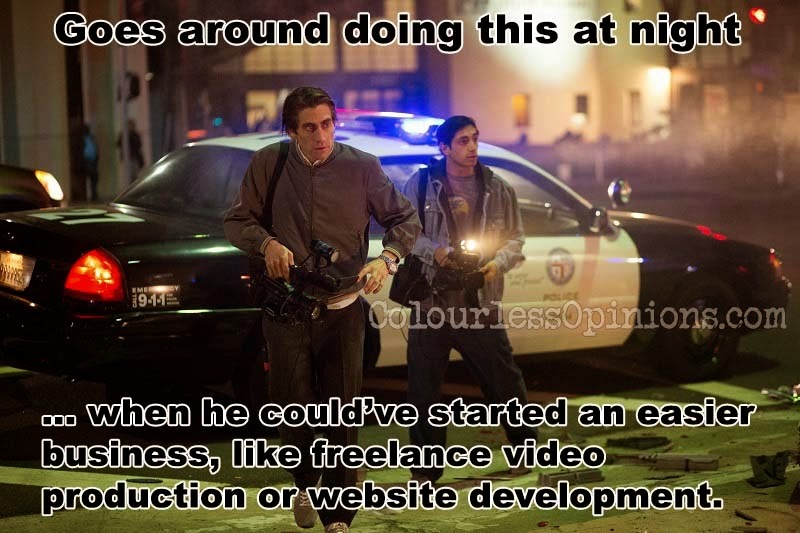 Inspired by the money that can be made in this business, he trades off his off stuff for a camera and a cop radio scanner to venture into freelance video journalism, and would abandon all codes and ethics just to obtain valuable graphic footages. 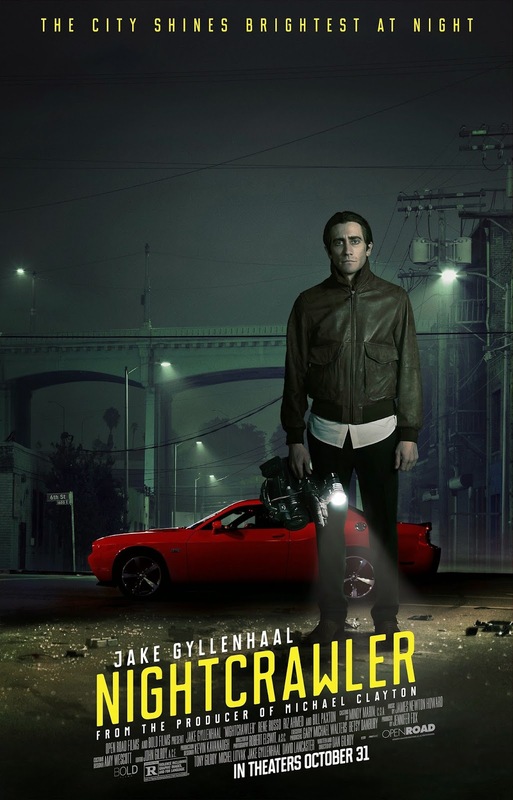 Jake Gyllenhaal has a subtly impressive track record in his career, from playing critically acclaimed supporting roles (Prisoners, Brokeback Mountain) to cheesy blockbusters (Prince of Persia, The Day After Tomorrow) to well-performed lead characters (End of Watch, Source Code, Zodiac), but perhaps, none of them are as unusual and transformed as he is in Nightcrawler. It’s an almost perfect display and definitely memorable performance of an eerie but engaging character with quick-wit, fast-talking salesman-like ability, geeky and ballsy awkwardness, creepiness and sociopathy. The film is an eye-opener for those who’re unfamiliar with this line of work. The character, Bloom, learns quick with great attentiveness and has the patience to sit in his car and wait for police reports on the radio scanner. Once he identifies an incident worth filming, he’ll drive at extreme speed, chasing against time to arrive at the scene before his competitors and the police to get the closest and best images of dead or dying people. He disregards everything’s that’s clearly wrong just to get what he could sell to the morning news director by the name of Nina (Rene Russo) whose ratings are the lowest in the city and therefore in desperate demand of extremely graphic footages that could attract more viewership. This is where the film plays around with media satire. Knowing that he needs help, he hires Rick, a jobless hobo who has no idea what he’s really getting himself into. At times, Bloom would even tamper and set up dangerous crime scenes for his shots. From the linear storyline, the viewers learns how a man with lack of mainstream education and zero experience in the field could scale his business in a matter of months using only the knowledge gained from the internet and meticulous observation, the idea of others, a small capital that he probably doesn’t even own in the first place, and cold-hard balls. With persistent thick-face hard-selling (and marketing), strong dedication, an the eye to seek for opportunities through others’ weaknesses and a harsh approach, Bloom manages to leverage control for almost everything and everyone. He creates demand, attacks loopholes and eliminates competitors, and it’s fun to watch the whole progress. Rene Russo’s (Thor films, Lethal Weapon 3 & 4, The Thomas Crown Affair) performance deserves compliments as well, effectively expresses the desperateness, work-weariness, subtle shock and dilemmas that the character has in several scenes. However, the British rapper Riz Ahmed, who I thought was Hal Rudnick from Screen Junkies on YouTube, gives a rather weak performance that fails to drive sympathy for the character who’s cluelessly being taken advantage of as an employee, such as in real life. There isn’t much of a background or development for the characters, but in this case, it doesn’t feel necessary as this isn’t about friendship or love, and the only focus, is on the progress and doings of the main character. It gets predictable when the viewers can grasp that there shouldn’t be a surprise that this guy would do anything just to succeed, and there’s a couple of minor flaws in general, but it doesn’t impact the overall freshness, entertainment and educational values of the film. It feels very wrong to want to see the character succeed in this story (like the House of Cards TV series), but the film may be indirectly criticising the viciousness of businessmen. Bad influence this film might seem to be, but this is business in reality, successful entrepreneurs take high-stake risks and “kill” others to win and get to where they are now. With this being only Dan Gilroy’s directorial debut, it makes us eager to see what he could do with a more serious budget. Censorship in Malaysia: Not sure if there’s any scenes skipped but the vulgarities aren’t even muted. Second opinion: My girlfriend thought it was very fun to watch as well. Verdict: One of the best films I’ve seen this year, and perhaps the best career performance by Jake Gyllenhaal.